International taxation has always been a dynamic subject. For CFOs and other senior finance professionals with responsibility for overseas operations, staying on top of the rules and best practices, which are constantly updated, can be a daunting task. In many countries, including the U.K., the taxation of global groups has suddenly become headline news, increasing the pressure on finance professionals to be aware of changes in rules and the public attitude to tax. With the increased “noise” on global tax in the U.K, we thought it would be useful to provide readers with an update on the matters that seem most relevant and the changes most likely to take place. For those with subsidiaries or branches in the U.K., this should serve as a useful list of topics to raise with your professional advisers to see if there is any impact on your business. The trend for U.K. corporation tax rates has been downwards for many years. 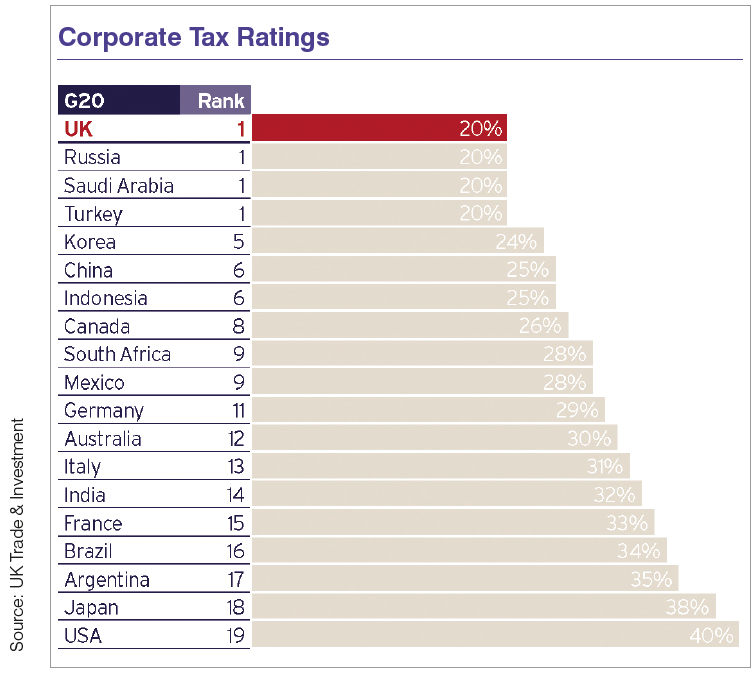 At the current 20%, it is one of the lowest rates in the G20 and the successful reappointment of the Conservative Party in the May 2015 General Election brings with it promises of no increases to most tax rates over the next five years under a “tax lock” pledge. The U.K. has long had a policy of not offering special deals or privately negotiated tax rates to entice businesses; however it is very unlikely that we will see an increase in the U.K. corporation tax rate anytime soon. Continuing the election theme, the Prime Minister put at the heart of his election campaign a pledge to alter Britain’s relationship with the E.U. in Brussels including holding an in-out referendum by the end of 2017. Regardless of the outcome, it is unlikely to result in significantly adverse implications for businesses doing business with/resident in the U.K. and trading with other nations in the E.U. The U.K. and E.U. would still need each other and not just for their respective trading markets. There are precedents for such a relationship; Switzerland and Norway have never signed up to the E.U. but have enjoyed healthy trading ties with the rest of Europe. We anticipate the U.K. – and particularly London – remaining at the forefront of development, finance/fintech, education, infrastructure, and innovation. Dubbed the “Google tax”, this is a new tax charged at 25%. 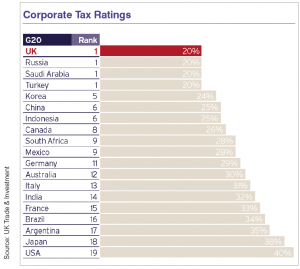 It applies to large multinational businesses with activities in the U.K. but with arrangements intended to divert profits away from the U.K. We would not be the fi rst to say that this is a knee-jerk reaction to recent publicity about a number of high-profile groups who pay comparatively little U.K. tax compared with their apparent U.K. sales, and usurps the OECD’s BEPS (Base Erosion and Profit Shifting) initiative, due to be implemented from 2016. While the intentions may be altruistic (and HM Revenue & Customs would say they are only targeting tax-avoiding multinationals) the complex legislation appears to have far broader implications. We hope guidance will continue to be issued to reassure those accidentally falling within these rules, but it remains an area of concern to those of us involved in international business and U.K. tax consultancy. In 2015, the rules determining the “place of supply” for telecommunications, broadcasting and electronically supplied services (TBES) signifi cantly changed. These changes affect B2C suppliers i.e. those providing services to individual consumers (as opposed to B2B i.e. those making sales to other businesses). In short, B2C sales across Europe incur VAT at the local rate where the customer is based, and the supplier must ensure that the VAT collected is paid across to the relevant local tax authority. There is no de minimis threshold for avoiding this obligation. Businesses therefore either have to register for VAT in each country where supplies are made (this could mean up to 27 registrations), or register under an E.U.-wide initiative known as the Mini One Stop Shop (MOSS). There are technically two options; the “Union” MOSS registration for businesses with an E.U.-VAT registration, and a “non-Union” registration for businesses which are not registered for VAT. Under the MOSS, businesses register in a single E.U. member state, and report all VAT charged on sales to customers located across Europe on a single filing. Businesses without an existing VAT registration can choose in which state they wish to register under the “non-Union” MOSS scheme. Even if you are keeping up to date with MOSS and the new rules, continue to talk to your advisors, as there are more changes expected. From 2013, the U.K. government introduced tax incentives aimed at supporting the animation, high-end television and video games industries (in addition to the existing relief available for film production). These reliefs are designed to incentivize investment into U.K. productions and support the necessary critical mass of infrastructure and skills in the U.K. in the longer term. Companies have been taking advantage of the ability to claim an additional deduction worth up to 100% of U.K. qualifying production expenditure and, if they are loss- aking, they can surrender such losses for a payable tax credit worth 25% of U.K. qualifying expenditure. These reliefs are modeled on the existing film tax relief, which has generated a significant increase in the film production workforce since its introduction in 2007. We anticipate an increase in the number of companies taking advantage of these initiatives. R&D tax credits are a company tax relief to help fund technological advances by either reducing the U.K. tax bill or by providing a cash payment. The tax break is applicable to all companies that create newor improved processes and products or enhance existing products and processes in an appreciably improved way. In 2013, the U.K. Treasury made changes to try to ensure that both profit makers and loss makers are treated equally in terms of the benefit they derive from the relief and introducing an “above the line” (ATL) tax credit of 10% for large companies, allowing large companies to claim relief previously reserved for small and medium sized enterprises (SMEs). While the jury may still be out on the success of that policy, the fact remains that many developed countries have some sort of R&D incentive and this allows the U.K. to compete. It is also thought to be an area where there are significant under-claims and there are definitely forces within government pushing to ensure more companies take advantage of incentives to which they are entitled. In line with the wider trend of putting ‘tax under the spotlight’ over the past few years, STBV agreements became compulsory in the U.K. from April 2014. U.K. companies with overseas business visitors without a STBV agreement in place are required to withhold U.K. taxes under the Pay As You Earn (PAYE) regulations. The PAYE withholding is required irrespective of which entity employs the visitor, pays the visitor’s salary, or the length of business trips to the U.K. Failure to account for PAYE can lead to payment of income tax, social security, interest and penalties being applied. The STBV agreement can exempt the U.K. entity from this withholding tax requirement. Although it is not tax-specific, it is worth noting that for non-resident individuals (including those exercising significant control over a business), or U.K. subsidiaries of overseas parent companies, opening a U.K. bank account continues to be a protracted process. Although the major banks have taken steps to simplify their Know Your Client (KYC) requirements, they are obliged to conform to the Financial Conduct Authority’s (FCA’s) regulations in terms of client identification and anti-money laundering documentation. Evidence including personal ID, residential address, source of wealth and/or funds will also be requested. Corporate accounts require a business plan outlining key customers, suppliers, evidence of business activity and financial forecasts. All of these documents must be in English and publically notarized. Corporate bank accounts are now typically taking at least one month to open (assuming that all information is provided in a timely manner). Our advice would be to initiate the process early to avoid delays. However competitive the U.K. tax system becomes, we hope that it does not singularly drive an overseas company’s investment decisions. Nevertheless, it remains a vital consideration and, despite the blip that is Diverted Profits Tax, the U.K. remains very much open for business. It is, however, more important now than at any time before to be talking to your U.K. advisor and asking questions about these changes (enacted and anticipated) to see what the impact might be on your company. Fitzgerald & Law’s Melissa Christopher is a Tax and Global Expansion expert, helping American companies set up in the U.K.